Norm Hudson, the inventor and manufacturer of this simply brilliant offroad hitch has done what many others have been unable to achieve – make an offroad coupling that is easy to hitch and unhitch, is extremely simple in it’s operation and allows for extremes of angles in all directions – 90 degrees up, 85 degrees down and 360 deg rotational. You’d be in a hell of a lot of trouble if you exceed any of these angles! The OzHitch overcomes the difficulty in aligning the two parts of the hitch system by its cleverly manufactured cradle head. Should you lower the hitch into the receiver slightly off the mark, the cradle head, with it’s sloping walls (directional guides), will guide the hitch into place – simple self aligning with no huffing and puffing trying to pull that damn heavy trailer with one hand while simultaneously trying in vain to slot the pin into position with the other. Once the central universal joint has been easily lowered into position, you simple slot the safety pin through the coupling, depress the spring, twist the safety pin to lock into the keeper – no fiddly buttons, no complicated two-handed levers, nuthin’ hard at all. When the safety pin is locked into position, there’s a Lynch pin to slot into place which acts as a secondary safety locking mechanism. Inside the central universal joint are Ertalon bushes (a self lubricating oil-filled Nylon that is incredibly tough, low wearing and low maintenance) which pivots in both the horizontal and vertical directions. The main body of the OzHitch houses additional Ertalon bushes to allow the main shaft to twist 360 degrees in the rotational direction. With all connecting surfaces being bushed, there is no rattling of metal parts and the inherent dampening ensures there is no noise in the system while off road and during breaking and accelerating manoeuvres. With the safety pin being inserted horizontally (rather than vertically like most others), the Lynch pin (and end of the safety pin) do not hang down where they can be potentially hit and damaged. It’s also easier to slide the safety pin in horizontally as you don’t have to stick your head under the towbar to put the Lynch pin in. To provide improved ground clearance, the OzHitch is able to be bolted to your towing tongue with the bolt thread pointing skywards instead of down to the ground. This not only reduces the parts of the hitch that tend to hook up on Terra Firma, but also prevents the threaded section from becoming damaged by rocks flicked up from your 4WD’s wheels. Being a relatively low overall profile, the OzHitch will allow for rear opening tailgates and barn doors to open easily without hitting the hitch – no more dented panels! The OzHitch is a high quality cast steel with no welds or joins to ensure maximum strength and is galvanised to ensure a rust free long life. All ADR testing was done, given the thumbs up and stamped with a 3.5 tonne rating. While at the ADR laboratory test facility, Norm tells us his OzHitch was tested to a much higher load limit (close to 9.0 tonne), proving the overall strength and safety for use with camper trailers, caravans, horse floats or anything else you may want to hitch up. Norm is no stranger to trailers; he was the owner of a well known brand of camper trailer for many years and had tried many types of off road hitches. This real life experience aided in his design criteria which entailed safety, simplicity, field serviceability (a 20mm bolt can be used if you happen to damage or loose the safety pin), low maintenance, capability of extreme angles and ease of use out in the field. 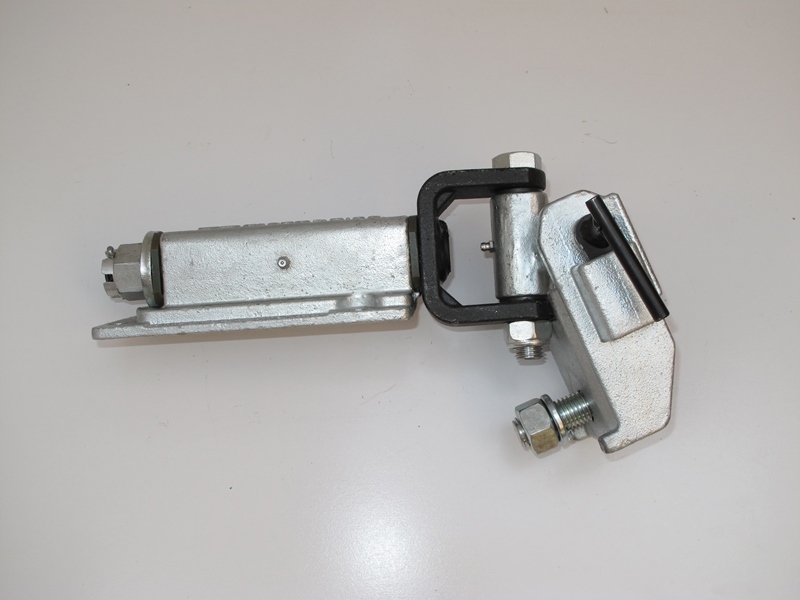 The OzHitch fulfils not only Norm’s objectives, but should put a grin on every fella that has ever struggled with hooking up an offroad hitch in sand or difficult situations. There should be no more huffing and puffing, no more frustrated swearing and no more skinned knuckles while simply lowering the hitch into position, easily slotting the safety pins in and beaming with confidence at the ease with which you’ve got the whole job done…you’ll look like a pro every time with an OzHitch.